Celebs are the last people on the planet who need editing. They dazzle fans in films, doing press, and walking the red carpet, but, for some reason, product ads airbrush them often beyond the point of recognition. Check out these ridiculously airbrushed celebrity advertisements. Although some of Julianne Moore's cosmetic ads have a surprisingly realistic look, her Bulgari luxury goods campaign a few years ago featuring provocative and ultra-glamorous photos of the stripped-down actress were more about illusion. You wouldn't expect pictures of a heartthrob in his prime, like Leonardo DiCaprio, to need much work, but his ads for TAG Heuer watches almost look like oil paintings rather than photos. One of the most endearing things about Jennifer Aniston is how real she seems, but the Aveeno lotion ads from the past couple of years (featuring Aniston's astonishingly smooth skin) appear more than a little fake. Eva Longoria's ads for L'Oréal Paris cosmetics and hair color are so airbrushed that her look is reminiscent of classic bombshell celebs like Ava Gardner. Glamorous makeovers are great—as long as the celebrity still essentially looks like herself. Christopher Walken's recent Kia Superbowl commercial was memorable for many reasons, including the 72-year-old actor's noticeably younger, smoother look. We can only speculate on how this was achieved. In addition to a paycheck, Walken got a much fresher image. Dior's stunning ads for the fragrance J'Adore are bathed in shades of gold—including Charlize Theron, whose skin is made to look as luminous and slick as spun-gold, almost giving her the appearance of a statue. 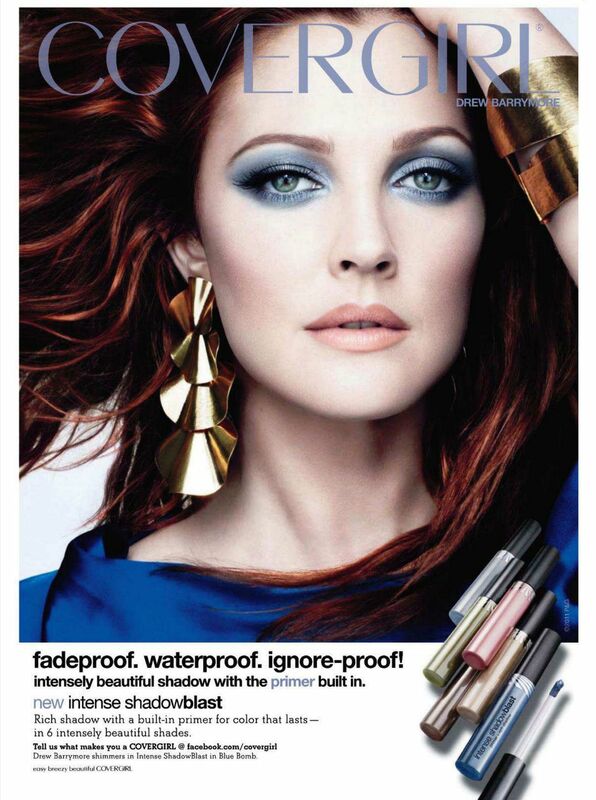 While ads for her own cosmetic line are very flattering, the photos from Drew Barrymore's previous Cover Girl campaign were so airbrushed and apparently overedited that the naturally lovely actress was barely recognizable. The well-known Lincoln car ads featuring the suave but heavily-shadowed image of Matthew McConaughey behind the wheel were laughably artificial enough to inspire a parody on Saturday Night Live. One of Diane Keaton's heavily-edited L'Oréal Paris commercials ran during the 2014 Golden Globes, which featured a seemingly unfiltered Keaton as a presenter. The contrast between the two images of the 68-year-old star created quite a buzz. In Sofia Vergara's Pepsi ads, the actress looks noticeably smoother and younger. The enhanced, airbrushed image of the Colombian beauty is so striking that it actually distracts from the product itself. Thanks to obviously dim lighting and possibly other tactics, the 57-year-old Alec Baldwin looks as young and svelte in the new Amazon Echo commercial as he did when he starred in the 1997 film Ghosts of Mississippi. Robert Pattinson's dramatic, shadowy Dior Homme fragrance ad campaign evokes memories of glamorous old Hollywood leading men, at the expense of sacrificing Pattinson's own popular image and unique good looks. Blake Lively has done ads for a number of products, from hair care to fragrance; but many, such as the Gucci Premiere ad, distract from or disguise her fresh, natural, windswept beauty and arguably over-glamorize her. In an attempt to glamorize Chris Pine for the Armani Code fragrance ads, some of the photos actually make the young, boyish-looking actor appear significantly older than 33, his age when the campaign began. There's definitely something wrong when celebs are unrecognizable in ads, and looking at Julia Roberts's ads for Lancome's fragrance La Vie Est Belle, it seems the editors got carried away. The images only faintly resemble the iconic star.